I’ve been thrilled by visual art most of my life. A combination of blessings, like where I grew up and one particularly inspiring teacher when I was still very young, created me, a person who is literally vibrationally activated when I’m in the presence of exciting, great art. And there is a lot of great art in this world. So on August 12, 2017, as my beloved Charlottesville was under attack by domestic terrorists, I was having a very good day. This hurts a little, in that place inside me (a vestigial mental construct left from my odd, if art-infused, childhood), but the bigger, better place inside me knows that it was okay for me to spend the day at MoMA with a friend, renewing myself by visiting the Rauschenberg exhibit called: Robert Rauchenberg: Among Friends. You can read about it. You can (aka should) go see it if you are within a few hundred miles of New York City. 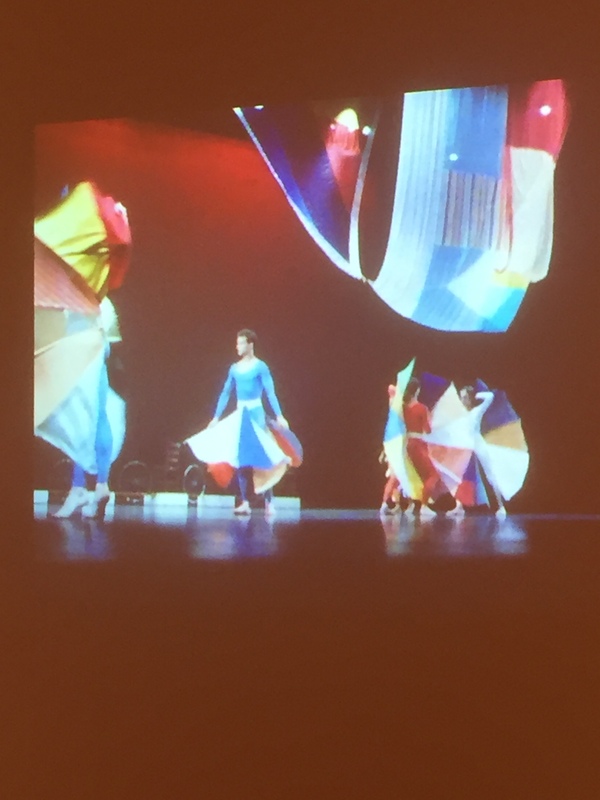 There are great pictures and video clips on the MoMA site (linked above). I’m not going to describe the exhibit for you, or review it, or narrate what was in each room, elucidate each chapter in his artistic journey. 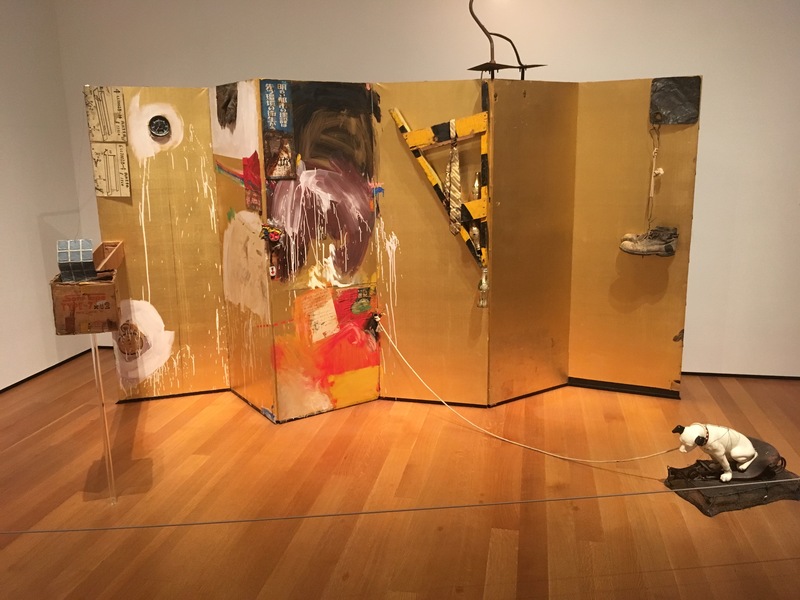 Rauschenberg’s work as stage set for dance. Just want to say a few things. Like this: the exhibit is a window into a great and thrilling mind. 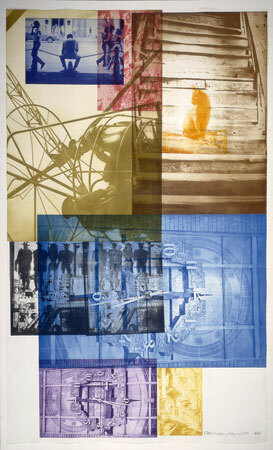 Rauschenberg’s openness and his seemingly endless flow of ideas and “I’m going to try this now” moments, his humor, his relationships, his appreciation of fellow artists from composers like John Cage to choreographers like Merce Cunningham, and visual artists from Jasper Johns to Sue Weil to Cy Twombly. All of these things added to his inspiration. An angsty life of isolation, darkness, competitiveness, bitterness was not for him. He was an effluence of joyful creative pollination. His life and how he chose to live it, devoted to his art, to his ideas, to the ideas and art of others, inspired by the ideas and art of others—that was as much a thrill as seeing the art itself—both the majestically large pieces and the small pieces, all of it both conceptual and very real and glorious. I mean he tried things. Nothing was “not worth” his exploration. He’d have an idea and bam. 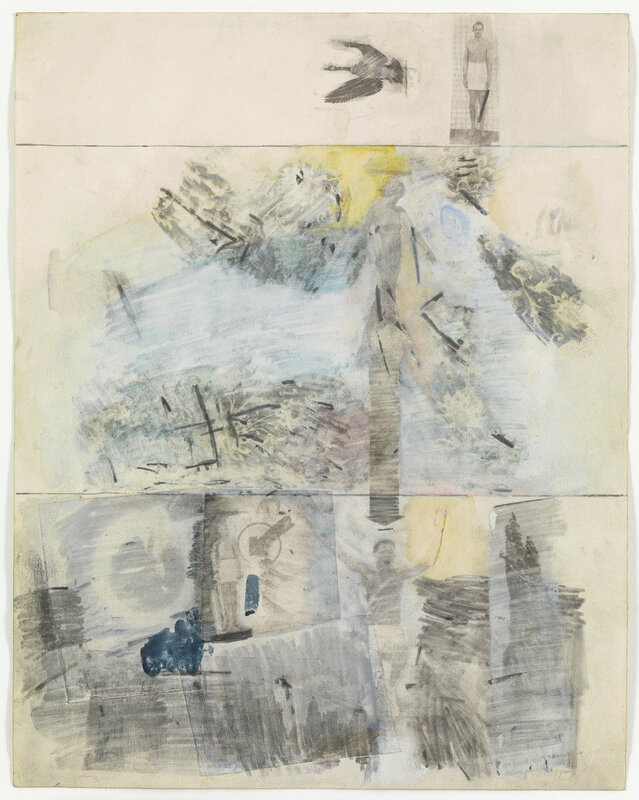 I have no idea how his “Erased De Kooning Drawing” was received critically. Who cares? 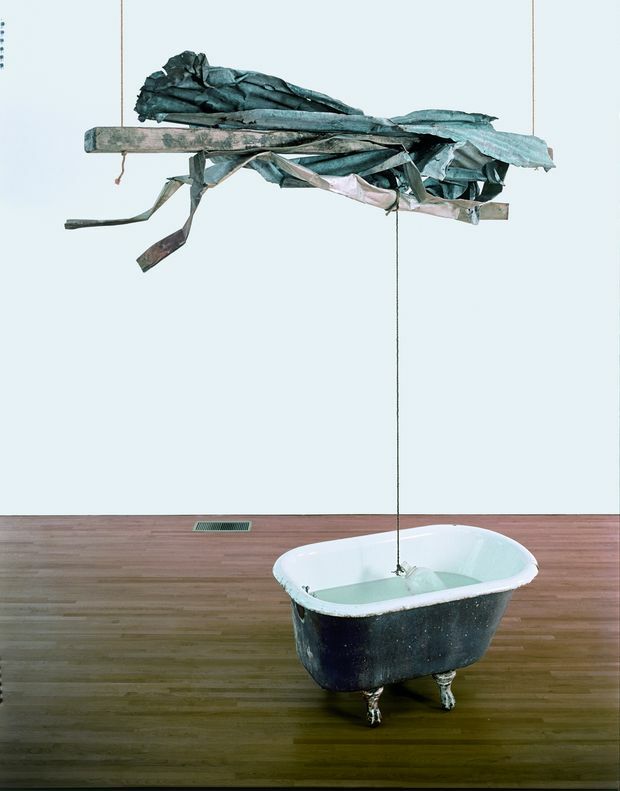 He went to visit the great De Kooning himself and said, hey, I want to try this thing. I want to make a piece of art that is an erased drawing. How about one of yours? De Kooning was like, okay cool. Here is a piece I actually like a lot so have at it. 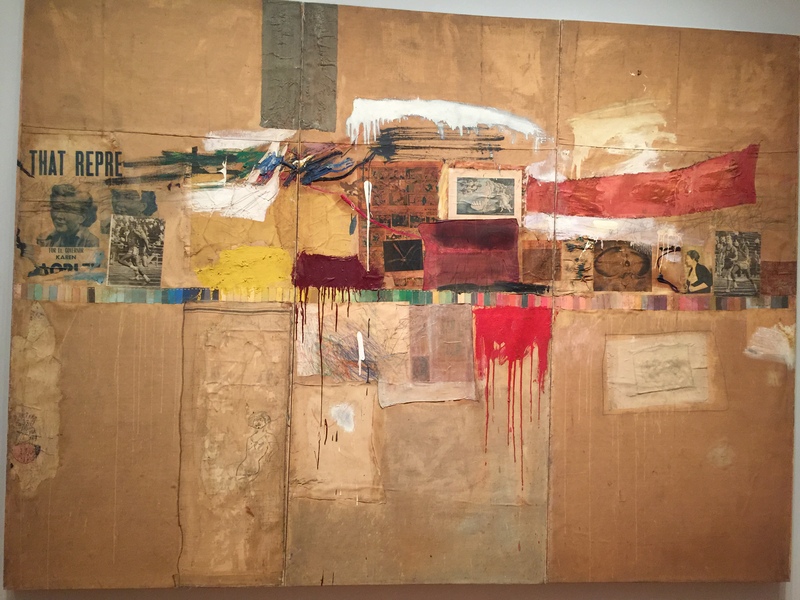 Rauschenberg gave it a shot. He doesn’t seem to have started an entire phase of his art based on erasing drawings, but it was a thing he did. Jasper Johns came over and said, cool. Let’s frame it. The drawings of all 33 cantos of Dante’s Inferno. I could have spent the entire day just on those. My God. His florid, red pieces—gorgeous assaults. I want to fill a house with them and then never leave it. 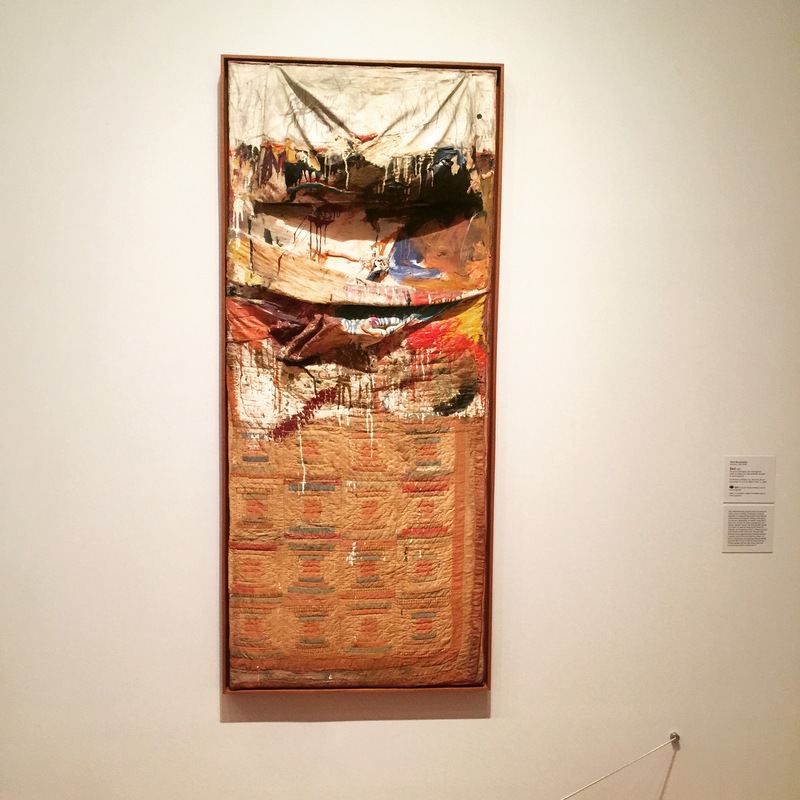 The tire tracks—John Cage’s Model A, one tire dipped in black paint, Rauschenberg’s 20 pieces of typewriter paper stapled together. 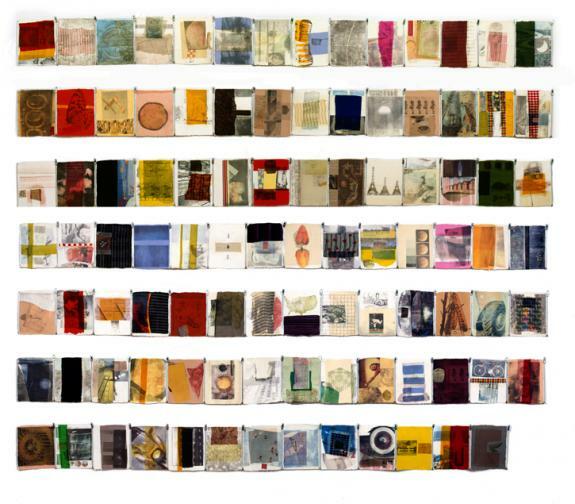 Hiccups, the 97 zippered-together pieces of handmade paper, each an explosion of color and each a unique assemblage of transferred items run through a lithograph press. His lithographs and silk screens. I mean those ALONE…. 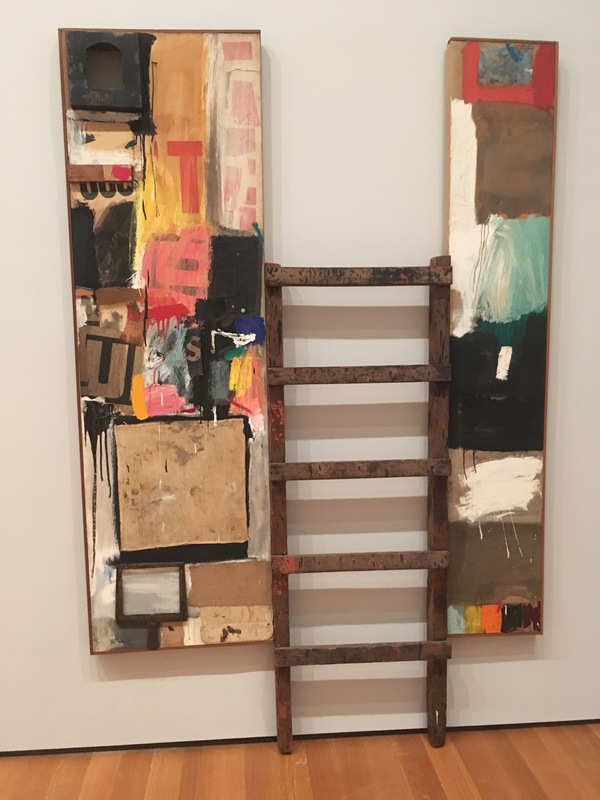 His use of all media from toothpaste to old clothes to rusty nails to glue to film to silk to tossed out shipping boxes to canvas and paint and about a thousand other things. His 9 Evenings combining an incredible mix of artists and audience-participation and lights and performance. His humor. The stuffed goat in the tire. Majestically itself. Having gone through several versions. 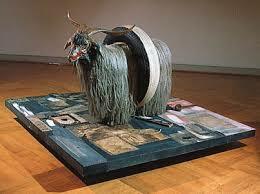 I mean, how can you just have one version of a stuffed goat in a tire? Some of his pieces are statements, some of them just… something excellent to look at. Well, no, I take that back. They are all statements, aren’t they? Statements of an aesthetic and a consciousness and a will to create. I love how being in the presence of a lifetime of art—his or any artist’s—Van Gogh, Renoir, Pollack, O’Keeffe, Kahlo, Rothko, Nevelson, whoever it is—invites you into the soul of that artist. I guess it’s like that with reading someone’s writing, seeing someone’s dance, hearing someone’s music. But the difference is that you can be inside a room with ten visual creations at once, in an exhibition with 500 pieces, maybe. You can’t simultaneously watch 500 ballets or read 500 poems or listen to 500 sonatas. So this experience of visual art is like an immersion, a flood. You open yourself to it and you are filled with it. If you let yourself, you almost become that person for a moment. Or maybe for a lifetime, because you have so fully experienced that outflowing of another human, one so willing to commit her or his ideas to the plane of perceived reality (I’m being very careful here). 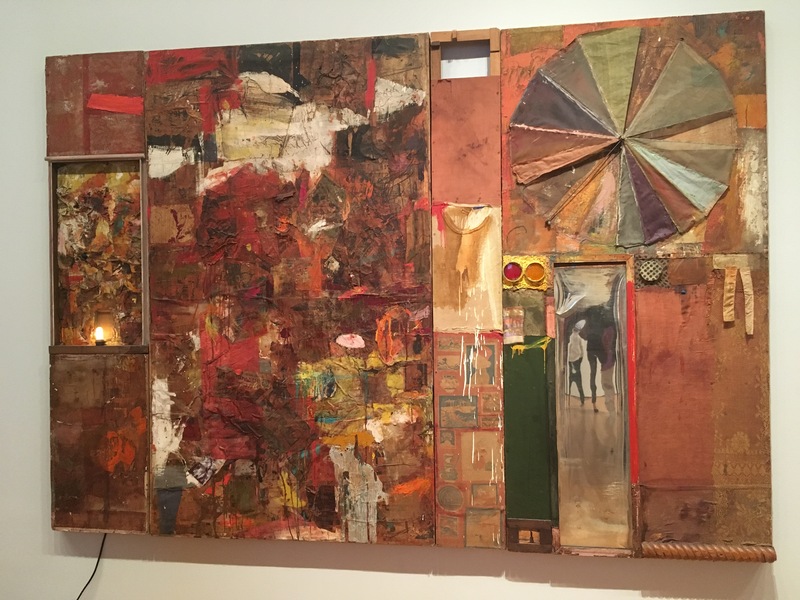 For some that is a risk and for others, maybe for Rauschenberg, simply an imperative, like reproducing, or an instinct, like breathing. As haters come out of the darkness, I will not let myself forget the light that is in us. Spend a day with art—every city has a place you can go, a gallery or museum with a room you can sit in and feel the flood of ideas and— beauty or not beauty—artistic spirit. Some say that is the very thing (not brutality, not hate, not rage or selfishness or the lust for power) that defines humanity.